Leading Manufacturer of pa system from Nashik. We are Manufacturer of IP based Public Address (PA) system which is communication link between the peoples in city and Control Room - Authority. To manage harmony in city operation, it is very essential to have effective management of traffics and incidence on the road. Direct communication from people on field and Control Room - Authority offers make this easier and effective. 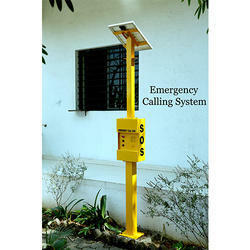 IP based PA and Emergency communication system provides service for same. Live PA announcements from control desk in individual zone, selected zones, all zones PA speakers. Individual PA points (IP amplifiers) will be addressed with call number and names. Further it will be grouped to make PA zones. E.g. A Zone, B Zone etc. Pre-recorded messaged stored at server memory used to play at different zones simultaneously at scheduled time. Recorded message announcements via control desk. Audio recording for all PA calls from central control desk. Disaster or standby control desk functionality through soft control desk station operated on wireless data network. Excellent noise cancelling and automatic volume adjustment features for communication from noisy streets. Vandalism protection and auto diagnostics of speakers and microphone ensuring 100% availability of PA system.